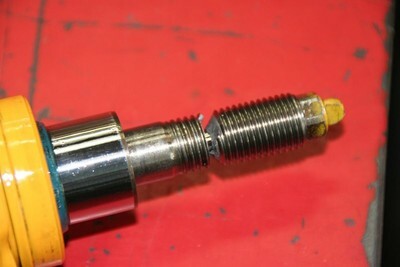 This is the proper way to tighten struts but without any special tools. The fancy socket there is a 13/16″ Sparkplug socket with the rubber insert removed. 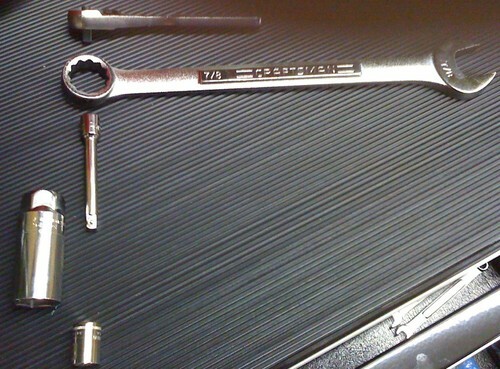 Turn the socket with the flats on the outsised using a wrench, in this case 7/8″ Now the tricky parts is using the 1/4″ drive 6 point socket to hold the strut top. A breaker bar would be better here but a ratchet will do just fine also. All these tools were in my basic Craftsman tool kit I have at home. This eliminates the risk of either damaging the strut mount by tearing it with turing torque or over-tightening the strut top. Also make sure to use the Koni supplied nut to hold the damper in the upright on the NG900/9-3. Using the original nut will ruin the damper. 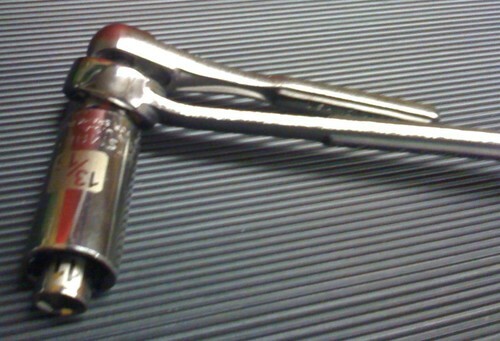 The new one tightens with a pin spanner and is commonly left loose causing noise. Hope this helps you. “Too Tight.. Not warranty” This customers mechanic kept tightening the top nut to fix a clunk he caused by leaving the large lower nut loose that holds the damper in! This entry was posted on Tuesday, June 23rd, 2009 at 3.17 pm and is filed under Chassis, HowTo. You can follow any responses to this entry through the RSS 2.0 feed. You can leave a response, or trackback from your own site. just exactly what i was thinking about ..but was looking for some advice before the job..thank you very much! For my ’97 900 set, I just got a 24 mm deep socket and a 1/2″ socket adapter (or it could be another socket that fits your torque wrench) welded at the local muffler shop for $5. Your price may vary! Or is something not right here?